Could Gerard Vroomen’s latest creation be the spark of something bigger and better? What a difference one month makes. Our first ride on the new 3T Strada came on the steep climbs at PressCamp in Utah on a frame that was too black, too big and with gearing that was too tall. When the very first production bike hit the U.S. shores a few weeks later, it landed at the RBA clubhouse painted, medium-sized and with lower gearing. “Is it a crit bike?” others keep asking us. The level of confusion on their faces is entertaining, and this pretty much sums up the new 3T Strada. It’s all about the numbers—aero numbers, rolling-resistance numbers, unique geometry numbers and stiffness numbers. The bike stands apart as it minimizes, maybe even eliminates, all forms of excess and focuses instead on the essentials of performance. The left fork leg uses more robust dimensions to fend off the greater braking forces and to clear the caliper. 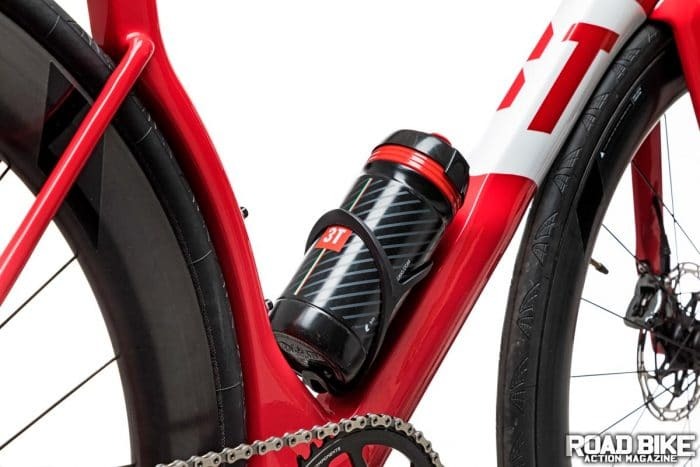 water-bottle mounts are intended to “hide” the bottles from the wind. The crown of the fork is unbelievably short, and the short 36cm axle-to-crown height combined with the 14.3cm head tube means the front is aggressively low, and combined with the 97cm wheelbase, it ensures that the 3T is also short and quick to react. By virtue of using a thru-axle, which helps minimize lateral flex, the chainstays look downright anemic compared to most bikes that rely on overbuilt chainstays to fight the flexing forces that are the byproduct of using a standard quick release. The back of the bike is surprisingly comfortable in the saddle, and much of this is thanks to the small tube shapes of the rear triangle allowing slight vertical compliance. This means less bouncing of the rear end and more time contacting the road and driving the bike forward. The front end of the bike rides incredibly stiff with a geometry (73-degree head angle) that is highly responsive and race-oriented. If it looks like there’s very little clearance between the tire and the seat tube, you would be correct. Luckily it’s a 28mm tire. Our test bike was fitted with a 50t chainring matched with a 11-36 cassette that gives the same range as a 50/34 and 11-25 cassette. Knowing full well that range is insufficient as a workhorse road gear, 3T is working on their own cassette to better optimize gear spacing that, rather than having large gaps between each gear, instead has tighter gears on both ends with bigger jumps in the middle. But more important is the fact that the Strada is ultimately designed for the 12-speed drivetrains that Gerard (with a wink) acknowledges are coming down the pipe. Once up to speed, the bike is an absolute rocket. The tire clearance is tight, and after the first outing, it looks like we did get a bit of scuffing of the paint as debris on the tire contacted the frame. The frame is very stiff and might be the first disc bike we’ve ridden that had zero disc flex under hard stand-up efforts. The bike actually provides a slightly better ride than what we’ve come to expect from an aero road bike, and we can probably thank the 28mm tires for that. The Strada has three water bottle mounts with the combination of the lower downtube mount and no front derailleur providing the best aero numbers. While the RBA gang has mixed feelings on the overall versatility of the 3T Strada, we are sure of one thing—Gerard Vroomen may very well have afforded all of us a unique looking-glass into what the future road bike could look like. And who is to argue? After all, who among us saw so much range in the road bike design principles we are now taking for granted just a few years ago? Electronic drivetrains, big tires, wide rims, disc brakes and suspension—really?! Other than just a one-trick-pony crit bike or for Floridians that have nary a climb as far as the eye can see, the current status of the Strada (as currently geared) would be a novelty for most serious road bike consumers. No, the current gearing wouldn’t be a problem for someone riding non-competitively, but for racing or fast group rides, finding the perfect cadence is essential. And right now, for a 1x drivetrain to deliver that, there needs to be more than 11 speeds. Typically, Gerard planned for that all along.